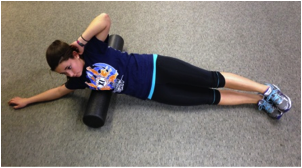 Be Proactive, Not Reactive When It Comes To Preventing Injuries, Part 2: Foam Rolling | Run S.M.A.R.T. 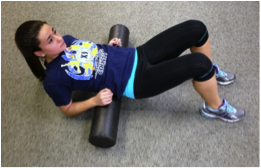 Foam rolling is a type of self myofacial release technique using compressed foam in a cylindrical shape. The rollers are typically 6 inches in diameter and cut into 36 or 12 inch lengths. The shorter lengths are ideal for traveling or keeping in the car, but I prefer the wider rollers for home and clinical use. 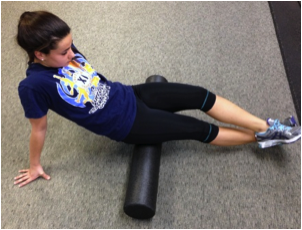 Foam rolling as a standalone soft tissue management technique is important and useful, but it is not a cure-all and just foam rolling alone will not prevent injuries, but it’s a start. 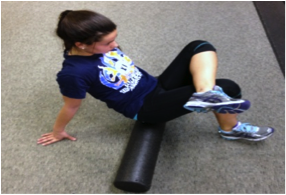 Foam rolling assists in loosening and manipulating muscles, fascia (connective tissue) and tendons. Because soft tissue management is so important in preventing and treating many types of running injuries, foam rolling should be done every day, or at least every other day. Extra attention should be given on off days to soft tissue management, focusing on those muscle groups that may have been tight during your workouts or long runs. The major muscle groups that are typically targeted with foam rolling are the hamstrings, Iliotibial bands (ITB), lower leg (gastroc/soleus/achilles tendon/anterior tib), hip (glutes/piriformis /flexors), quadriceps, trunk (lats) and back (lumbar/thoracic) muscles. You should always consult with your physician or physical therapist prior to beginning any new treatment, however there are relatively few contraindications with this technique. A quick “scan” of the muscle group can usually tell you immediately the tightest region of that muscle, however never roll over a hematoma (bruise), acutely swollen area, vertebrae if you have a disc injury, osteopoenia or osteoporosis or when you suspect a muscle tear before consulting with a healthcare professional. 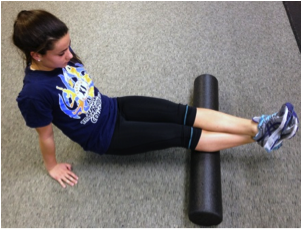 If you have significantly more pain in one area of the same muscle than other, stop rolling. 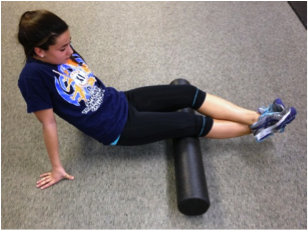 Just like any other specialized technique, foam rolling is not for everyone. Begin with slow, controlled rolling movements of each muscle group. I typically instruct patients and clients to spend a little extra time on those areas that feel tightest or hurt slightly more when rolled. This extra time will provide an “acupressure” type release where sustained pressure on a muscle spasm help to release that tissue. 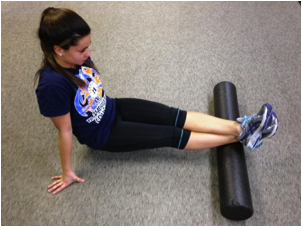 Use your arms and opposite leg to help lift your body off the roll. Sometimes even your own body weight is too much weight on the roller or if the roller is too dense, you may need to relieve some pressure to make it more comfortable and tolerable. Stick with the same muscle group for approximately 2-5 minutes, depending on how much time you want to spend rolling during that session. In my last post, I explained that static stretching should never be done before a run, only on off days and after a run as part of your comprehensive prevention program. I feel the same way about foam rolling; however there have been relatively few professional articles showing the benefits or pitfalls of one over the other. Expect that the first few times you roll, it is going to be slightly uncomfortable, especially if you have never done any soft tissue management and are predisposed to muscle tightness. 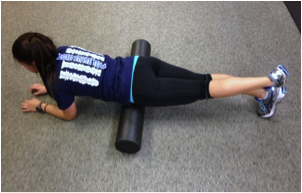 As you continue to self manipulate tight muscle groups, you will find that the soft roller is ineffective and you can tolerate longer periods of time on each muscle. 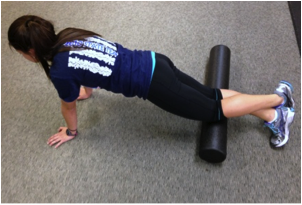 There are several types of foam rollers available and many companies that offer their own version of the roller. The most popular types are the soft white rollers, the more dense black rollers and the newer “Grid” type rollers with knobs on the surface. 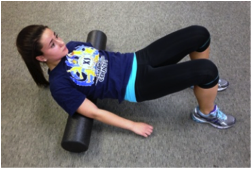 The following pictures show positioning for each muscle group at the start and the end of the roll, but it is important to roll out the entire muscle. For example, the IT Band starts at the top of your hip and continues all the way down your leg to just below the knee. To be most effective, you will need to roll that entire length of the muscle, working the tendons, fascia and muscle belly. 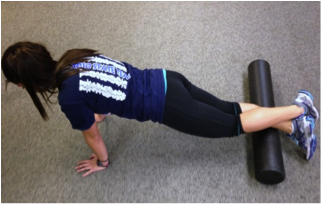 Foam rolling is an important piece of the puzzle when considering a proactive injury prevention program. By maintaining a consistent prevention plan, you will be sure to give yourself the best chance of staying on the road. Chris Lauretani, PT, MS, CSCS, CKTP is the founder of Symmetry Physical Therapy in Westchester County, New York. As a Licensed Physical Therapist, Certified Strength & Conditioning Specialist and Certified Kinesio Taping Practitioner, Chris works extensively with runners of all levels while serving as a sports medicine consultant to numerous professional athletes, organizations and running clubs.